In this next installment in our ‘North Georgia Wedding Venues‘ series we’re getting to know some new friends, Arleene & Wayne Ward, owners of Covered Bridge Farms, who are located in Murphy, NC just across the North Carolina/Georgia state line. Arleene was kind enough to answer a few questions and we think it will be quite beneficial for you as you begin or continue your search for just the right venue to have your wedding. For those that are unfamiliar with this area Murphy is only about a 20 minute drive from Blairsville and the same could be true, give or take a few minutes, if you were traveling from Blue Ridge or Hiawassee as well. We’ve included a map at the end of this post that will give you some indication how close in proximity we’re talking about. Unique Events: First off, thanks so much Arleene for allowing us a little bit of your time today. Let’s begin by your telling us how Covered Bridge Farms came to be? Covered Bridge Estates: My husband and I are extremely blessed to have found our property over twenty years ago, and we love sharing it with our friends and family. Entertaining has been a big part of our life, so it became a natural extension to want to share this beautiful place with others, as well. Unique Events: At what point did you and your husband, Wayne, decide to utilize the property as a wedding and event venue? Covered Bridge Estates: After we built the first covered bridge about ten years ago, I began to visualize it as a romantic and beautiful wedding site. Four years ago, friends approached us with that same vision for their own wedding. Since then, others have asked to get married on the bridge, and we decided that this was the year to go public. Unique Events: As this may be our readers first real exposure to Covered Bridge Farms, can you briefly describe for them some of what they may find on your property – natural features, facilities, amount of acreage, etc.? Covered Bridge Estates: We have over 100 acres of land, 30 of which is in pasture, and the rest is heavily wooded mountainside. We are surrounded by mountain views. Nearly half a mile of Hanging Dog Creek winds its way through the pastures, over which we have built three bridges, two of them covered. We also have a half-acre spring-fed pond, overlooked by a gazebo. 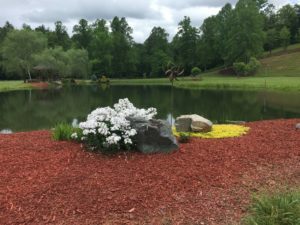 Gardens have been installed near the bridges and around the pond. We have three homes on the property, each with a unique purpose for weddings. On the lower level of the large, main house is an elegantly appointed suite of rooms for the bride and her bridal party to get ready on the day-of. A small cottage is available for the groom and his groomsmen. There is also an apartment that can be used as a honeymoon suite. Unique Events: Is there a typical size wedding that seems to be a good fit for you and if so, what that might be? Do you have any minimum requirements? Covered Bridge Estates: Weddings of 60-75 people can be accommodated on the covered bridges. Larger parties are possible. There is ample parking. I would suggest a tent rental for those larger parties so that guests can escape either hot sun or rainy weather. We have no minimum requirements. Unique Events: As we know, each venue we come across is rather distinct in what they offer their wedding clients. Some only rent out & allow the use of their facility & property while others offer something akin to an all-inclusive wedding package that includes the aforementioned coupled with other wedding related services such as planning & coordinating, food, photography, etc. Give our readers an idea how you operate. In addition, can you give us a breakdown of any services you make available for your clients and for those services that you don’t, do you have something in the way of a list of referrals you can provide a bride and groom? 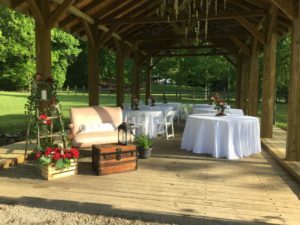 Covered Bridge Estates: We operate primarily as a venue site only. Our clients are permitted full freedom to select their own catering, entertainment, decorating, photography, etc. Included in our venue package, we offer the use of a bridal suite and groom’s quarters, chairs and tables (with linens), use of a Bose speaker with Bluetooth, a 6’ by 10’ portable stage, miscellaneous decorative items, pre- and post-wedding photo privileges on the property, free parking, and grounds clean-up after the event. We also have a 10×20 pop-up tent that can be used by caterers, or in any other way our couples see fit. I offer a list of preferred vendors, with whom I have confidence will provide quality services. Couples are free to choose any vendor they wish, however. Unique Events: I know that one of the major attractions at your venue is the covered bridge, hence your business name. 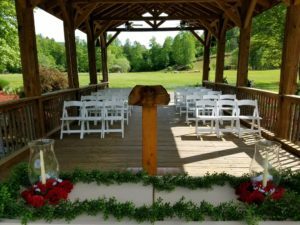 Aside from that one location are there other locations on your property that would be suitable to hold a wedding ceremony? If so, can you briefly describe other popular ones? Covered Bridge Estates: We actually have two covered bridges; one a bit larger than the other. There is a unique rock outcropping around which we have designed a garden. The gazebo at the pond can be utilized, or elsewhere around the pond with the gazebo as a backdrop. All these locations include electric service. Elsewhere, the creek banks offer several spots with small, picturesque waterfalls or rushing waters. Smaller weddings might like to scout out some of our mountain trails for a perfect little spot. Unique Events: What should the reader know about how far in advance they should book with you – are there times of the year that are busier than others? Covered Bridge Estates: Late October is heavily favored because of the spectacular fall leaf color surrounding our property. May is also particularly nice because temperatures are still mild and the spring flowers are emerging. Unique Events: Arleene, we are most grateful for your time today and willingness to help brides learn a little about you. Is there anything in particular you’d like to leave them with that we might not have covered thus far? Covered Bridge Estates: I think you’ve helped me cover everything quite well. Thank you for giving us this opportunity to share our special place with your readers. We look forward to helping couples achieve their wedding day dreams. Unique Events: As we wrap things up, tell us how our readers can find out more about you on the web and the best way to contact you? Covered Bridge Estates: I can be reached by phone at 770-714-8379, or by email: weddings@coverdbridgefarms.net.